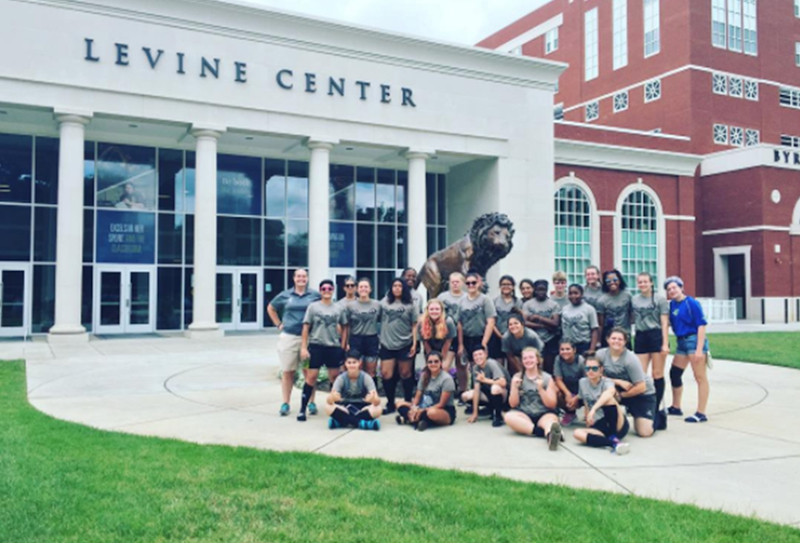 During the Ruck in Rock Hill, the Queens Rugby coaching staff opened up the campus to the players involved and gave campus tours. Below, Wurst poses with the Illinois Tornadoes girls team. Further down, Wurst and McKinney together, and McKinney poses with the first recruit for the men's team, Wando HS standout Rylee Ellsworth. Already the coaches - Frank McKinney for the men and Katie Wurst for the women (Wurst will also serve as Director of Rugby) - are in place and building their teams. We sat down with them and Dean of Students John Downey to talk about how the rugby programs came to be. Perhaps one of the biggest reasons was that Downey himself is a rugby player and routinely shows up to work with a bit of a limp after a game. The school considered rugby seriously, and the task force visited the Rugby Athletic Center in Charlotte. But in the end the school went with triathlon. And in fact Queens is quite good, finishing 4th (men) and 7th (women) in the nation this past season. But the rugby idea stuck around, and when the idea of adding rugby crossed Downey’s desk again, he said he’d support it if the school was serious about it, and committed scholarships to the program. “They said: ‘it’s going to be done exactly like triathlon,’” related Downey. Part of the plan was to change the gender balance on Campus. Queens was, historically, a women’s only college, only going coed in 1987. The school still has a large majority of women, and has been working on attracting more men to campus (as if having 70% women on campus isn’t enough). 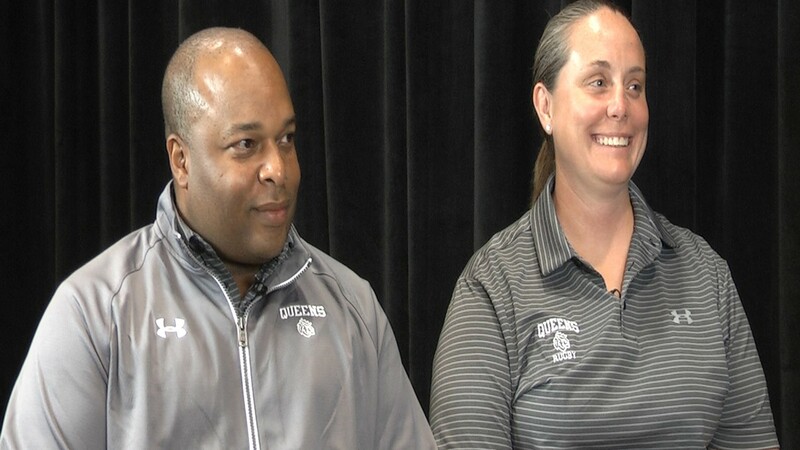 “We wanted to get more men on campus and started thinking about men’s rugby, and I said we should have women’s rugby at the same time, and we decided to do that, and it’s the right time,” explained Downey. 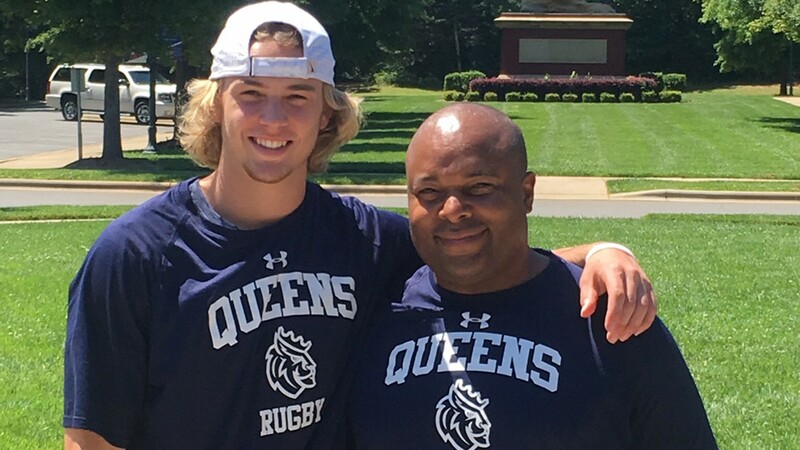 Queens will recruit inside and outside North Carolina, and while the school is very diverse - the most diverse private college in the state - Downey said they were looking for rugby to instill more vibrancy on campus. “There’s been no hesitation about rugby,” said Downey, who also plays the game and thus was a huge advocate for the game. Finding Wurst, who has worked with USA Rugby and has a background in Sports Psychology, and McKinney, who runs the North Carolina all-star program and has been a well-respected coach for some time, was key. Both were local to Queens and both are thrilled to be part of a new program. There’s more. Both McKinney and Wurst know what it’s like to coach in college club rugby. What they have at their disposal at Queens is very different. McKinney said he pinches himself every day about what being varsity means. He explained it this way to his Athletic Director. Now they need players. Both coaches have been recruiting locally and nationally, and have found out that there are experienced rugby players at the school already. Two have been instrumental in getting players for the men’s team. The teams will kick off their rugby story a little differently. The men’s team will be training beginning in the fall, and will likely play in DII in the Southern Conference (pending confirmation), with a 7s season in the spring. The women's team could well be in the NIRA (NCAA Varsity) league at some point, but will start out with the Women's DII Carolina league, which plays in the spring. For the fall, the Queens women's program will train and play non-conference games. Both will be looking to play at a challenging level but, added Wurst, the progression will have to fit the needs of the athletes. For both teams, said the coaches, there’s a lot of excitement and buzz already. Staff are asking about when the first games are, and athletes already students (and even one or two who left the school and now want to come back to play rugby) are looking to join one of the rugby programs. And Downey said there will be no hesitation; Queens expects to compete. “Eight years ago, we had a swim club, and we decided we’d have a swim team at the Division 2 level,” said Downey. They brought in a coaching staff, including an Olympic coach, and those coaches said Queens would win a national championship in five years. “When they said that, we had no pool,” said Downey. Five years later, they did indeed win the national championship, and in fact have won it three times in a row. Oh, and they now have a pool, too. “When it comes to rugby, just like with triathlon and with swimming, we are ready to do this right,” said the Dean.